The Dow Jones Industrial Average has been flirting with 20,000 and the S&P 500 is closing in on a 10 percent gain for the year. Investors are hoping 2017 is more of the same and that the bull market in stocks keeps going after almost eight years. But while many analysts expect further economic growth and rising corporate earnings, risks remain. Investors should consider them before taking big bets with their money. The stock market has gotten an unexpected boost from Donald Trump’s election victory, based in large part on expectations that the new administration and the Republican-controlled Congress will pass a package of tax cuts and spending measures, fueling the economy — which is near full employment — even more. That risks higher inflation than the Fed’s goal of 2 percent, says Green. “Should this happen, the Fed could perceive the inflationary pressures as leading to an overheating of the economy and raise interest rates quicker than markets anticipate to cool it down,” he adds. If U.S. interest rates rise faster than foreign rates, that should support the dollar, according to analysts at Wells Fargo Investment Institute. But if the dollar appreciates by another 5 percent, then “the cost of U.S. exports to overseas buyers could again reach a level that previously dented U.S. exports, corporate earnings and economic growth,” the analysts noted in a recent report. Investors may be banking on the Trump administration to loosen regulations and cut taxes on business. But these changes could take longer than expected, or their final form could differ from what Trump has put forth. “The more substantive proposals for the economy are likely to advance over years and only after significant compromise…if congressional leaders want to avoid long filibusters over tax reform,” the Wells Fargo analysts wrote. Congress also faces other pressing issues, such as the 2017 budget resolution, raising the debt ceiling, filling the Supreme Court vacancy and passing health care reform. “Even deregulation is potentially complex,” the analysts noted, with pushback in the courts and by industries that have made costly changes to meet existing regulations. 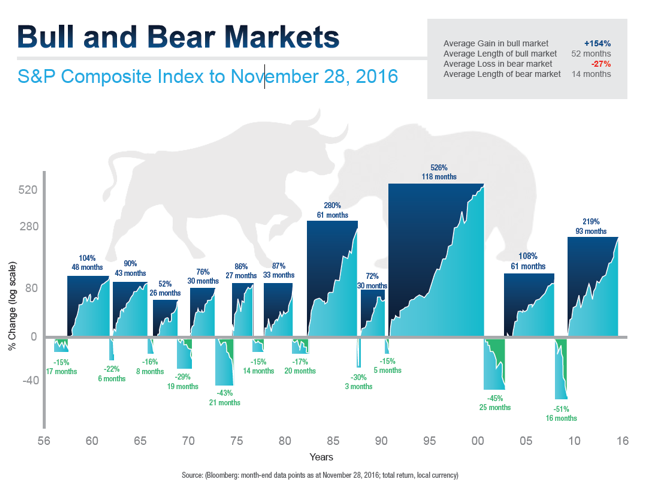 The average bull market lasts 50 months and is followed by a bear market that endures for 14 months, according to Joshua Mellberg, president and founder of J.D. Mellberg Financial, who created the below chart showing historical averages in these markets. By contrast, this bull has run for 93 months. “Therefore, we might conclude that the market is overdue for a correction,” Mellberg said by email. Age alone isn’t a reason the bull can’t keep charging ahead — but market valuations mean some high expectations for earnings growth are priced in. As Bloomberg pointed out, “to get where bulls think earnings are going, the economy would have to pull off a feat of strength that is unprecedented since at least 1937. Specifically, on the three occasions the U.S. has gone 7 1/2 years without a recession, earnings have never grown 10 percent this late in the cycle. That’s the rate analysts estimate for the S&P 500 in 2017.” Disappointments on the earnings or economic front could drag down stocks.